Due within 10 days of registration to hold your reservation. openings available. Email me if interested! Our itinerary will include dives at Kimbe Reefs, Witu Islands, and Fathers Reefs, offering a stunning variety of walls, coral gardens, black sand diving, and even volcanic islands with dramatic reefscapes, arches and swim throughs. We have arranged for early arrival and late departure stays at Walindi Plantation Resort, with options to include daily diving or not. The travel time to New Britian is long and arduous so you may want to extend your diving a few days, or just stay at the resort and try some birding or sight seeing excursions. Pricing will be discounted from published rates, the details of which will follow sometime before you are able to book your air travel. 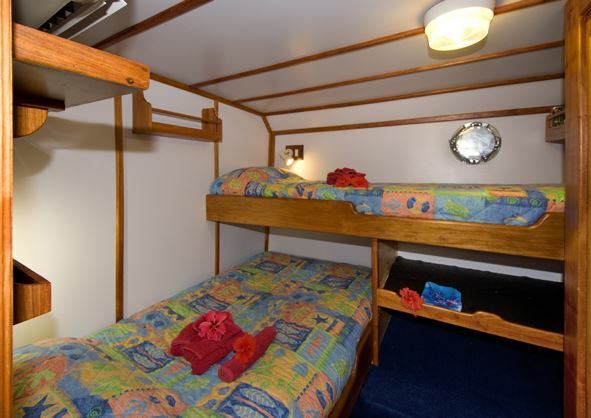 All cabins feature ensuite bathroom. Single cabins will have a $400 surcharge, and will be assigned based on sign up request and to best match single travelers. Don't book air travel without first confirming trip details with the trip leader. Manila may be a good intermediate stop, or Brisbane or Cairns Australia. Air New Guinea has international flights to several locations in Asia as well. You will get lots of help in planning your travel as we get closer to the time you will need to book air tickets. Divers are required to carry valid, in-force dive accident insurance, such as may be obtained from Divers' Alert Network (DAN).